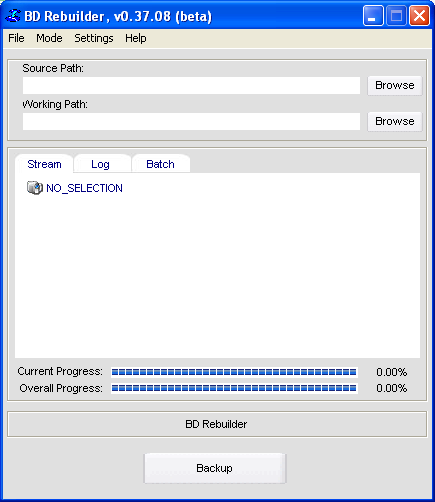 BD Rebuilder is a Blu-ray disc re-encoder and re-authoring package. From the same programmer as DVD Rebuilder, the current (early beta) version of BD Rebuilder allows you to re-encode Blu-ray movies and rebuild their navigational/content structure, just like how DVD Rebuilder works with DVDs. As this software is still in the beta testing stages, there will be bugs present and all bugs should be reported to this forum thread. sources that contain 2:3 pulldown flags. and UHD_VBV_BUFFER sets the buffer size. See HIDDENOPTS.TXT for more information. - Other minor corrections and cosmetic fixes.